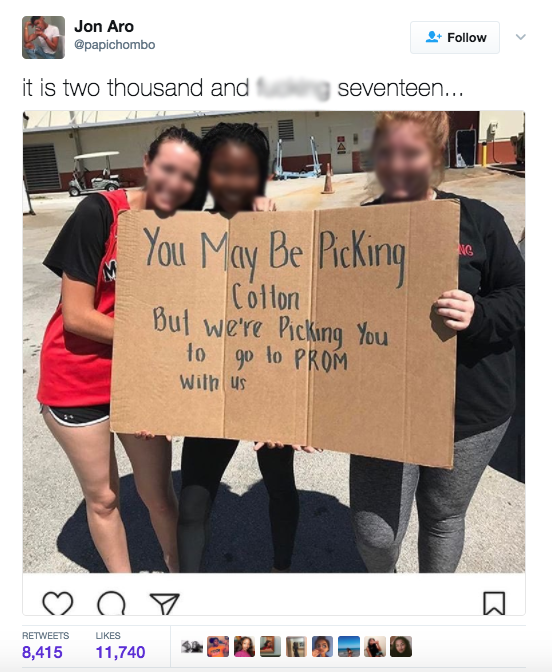 High school students have apologized for a racist "promposal" that went viral on social media. According to Yahoo, the students on either side attend Monarch High School in Coconut Creek, Flordia. 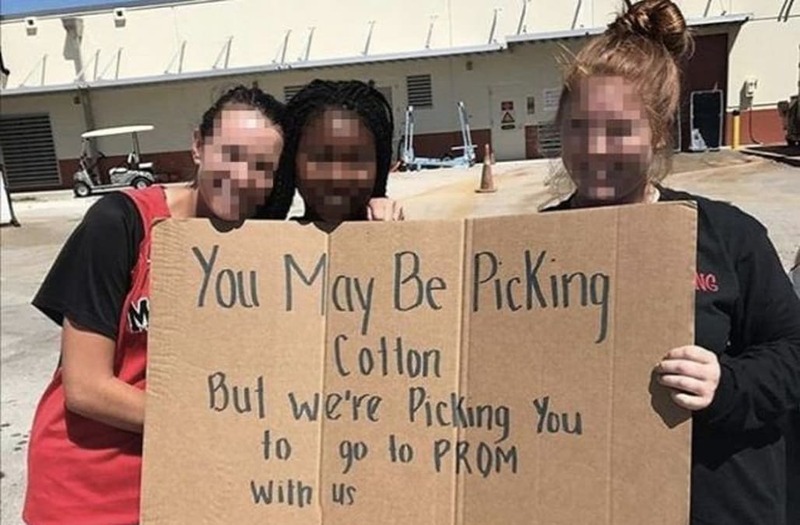 The photo features three teenage girls -- two white, one black -- holding up a sign that reads, "You may be picking cotton, but we're picking you to go to prom with us." Aro, an alum of Monarch High School, posted the photo with the comment, "It is two thousand and f------ seventeen..." The photo ignited social media, receiving thousands of likes and retweets. @papichombo honestly the black girl is more to blame for letting herself be disrespected by her "friends"
@papichombo @kaelaamarieee I knew people like this in HS. Didn't understand then, still don't understand now. "I decided to post it on Twitter because it is 2017 and stuff like this is completely revolting," Aro told Yahoo via Twitter DM. "I had thought we had been past [sic] the plight of racism. Apparently we hadn't." The father of the teen on the right told Local 10 News that the promposal originated as an "inside joke." The teen in the middle, who is homeschooled and heir to a cotton farm in Alabama, was originally not going to prom. The Monarch High School students have been suspended. "They really want to apologize for their extremely poor choice of words in this situation," a father of another student told Local 10 News. "They would like to take it back. They would like to find a different way to express this invitation to prom." One father and several Monarch students believe the sign did not have malicious intent.